This cost-effective 802.11ac access point with single or dual radio mode delivers high performance Wi-Fi networks for hospitality and branch offices, while minimizing costs for low to moderate density areas. The compact Aruba 203H AP is software configurable to operate in either 1x1 dual radio mode, or 2x2 single radio mode. It supports up to 867Mbps in the 5GHz band or up to 400Mbps in the 2.4 GHz band in single radio 2x2 mode. In dual radio 1x1 mode, the maximum data rates for the 203H AP are up to 433Mbps in the 5GHz band and 200Mbps in the 2.4GHz band. The 203H AP can be easily mounted to a standard data wall-box using the existing structured cabling system or converted to a desk mounted AP using an optional mounting kit. With its flexible deployment options, the 203H is designed to deliver high-speed Wi-Fi for cost-sensitive, medium-density environments. It ensures the most cost-effective Wi-Fi connectivity for indoor premises including hotel rooms, dormitories, small offices and remote workstations. Powered by PoE, the 203H AP minimizes power consumption with rich features that further facilitates a highly efficient and reliable wireless network. 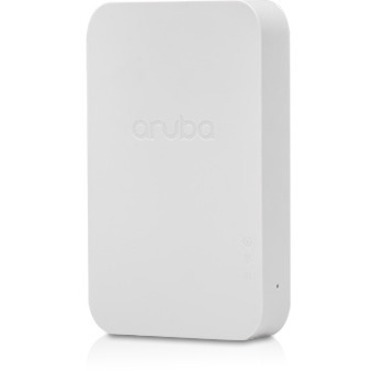 The 802.11ac 203H AP combines wireless and wired access in a single compact device. The local Gigabit Ethernet port can securely attach wired devices to your network. Additionally, the USB host interface on the AP allows the plug-in of Aruba BLE radio modules to enable advanced location and indoor wayfinding, and proximity-based push notification services.